We take pride in the fact that we do more than sell one-size-fits-all scanning hardware; we are constantly searching for new and different uses for image capture technology. Many of our best ideas have come from popular demand by our customers — and since Digital Check is a mid-sized, privately held company, we have the freedom to put our resources toward new designs that solve specific problems. For example, the ScanBox device pictured at right was originally developed at the request of partners in Europe and India, who were looking for a secure but inexpensive way to capture checks at self-serve kiosks. By combining one of our modified check scanners with a touchscreen, network module, and a secure metal case, we were able to devise a system that has proven easy to incorporate into many different designs, and is now used as a building block in payment kiosks all around the world. The SmartSource Adaptive scanner began with a client that needed to capture checks along with full-page invoices that needed to be kept together during the accounting and record-keeping processes after scanning. So, we were able to add a full-height camera and intelligent sorting capability to process fully mixed batches at high speeds. More recently, the SmartSource Micro Adaptive (pictured) was developed in response to requests for the same capability, but at a smaller size and a more affordable price point. It took a lot of creativity to get a full-height camera into a device that small – it may be the only check scanner in the world that’s taller than it is long. But it gets the job done, and to the best of our knowledge, no other MICR-enabled scanner offers the same combination of size and affordability for full-page capture. 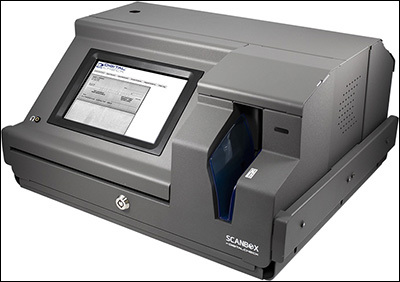 Other products, like our Quantum DS, cater toward the highly specific reader-sorter market where clients need to scan thousands of items at a time and sort into several categories. 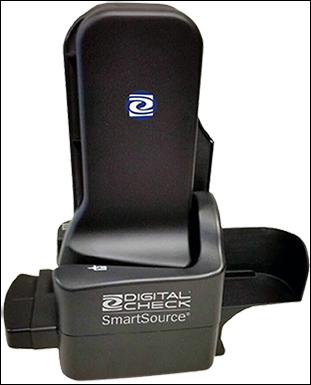 Or, we’ve recently upgraded an older product, the SmartSource Professional, with a high-speed model that can capture up to 200 documents per minute, with a two-pocket sorting function as well. This makes it able to compete with high-end back counter capture solutions, at an affordable price point and with a much smaller desktop footprint. For years now, Digital Check has been the worldwide leader in ultraviolet (UV) check capture devices, which are sold in both high-speed and single-feed versions on all six continents. We’ve developed network and Serial Embedded versions of several scanners to meet the ever-changing compatibility needs of different operating systems and environments. And we’ve also worked with industry associations and regulators all across the world to make sure we have ready-to-go solutions in place for teller, branch, and remote deposit capture each time electronic check clearing is introduced in a new country. Most recently, we’ve introduced a line of Serial Embedded scanners with built-in processors to handle API functions and image processing onboard the scanner. This has helped our devices achieve compatibility with many more operating systems and environments. Taking the same concept a step further, our network-ready scanners and the SecureLink module are widely used in virtual desktop environments, and have enabled innovative new uses inside and outside the branch. When you choose Digital Check, you’re not just buying machines from an equipment manufacturer that assembles components. You’re getting a partner that stays in touch with the changing needs of the market, the industry – and ultimately builds all of its products for you.